A small design I made but I'm quite proud of. It is self limiting because the chest in the end of the sequence sends a feedback to the smart inserter. 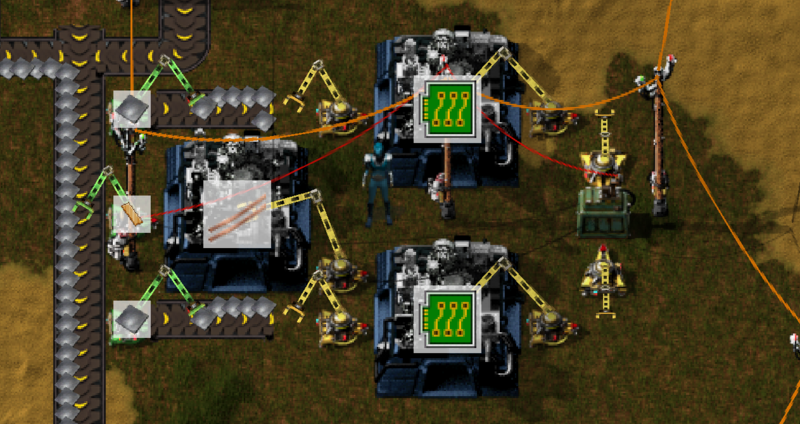 By limiting the production of copper cables you can control the entire unit. I applied a similar concept to several production modules up to science pack 3's which I'll post eventually. I applied a feedback concept from biochemstry, most organic processes have severeal substrates (ingredients) and an abundance of enzymes (the assembling machines), but are usually limited and controlled by abundance of only one component which is the most uncommon one. Equally, the slowest enzyme in a chain controlls the overall output of a pathway. Re: Self-limiting loops and ingredients. I did not more, because they thought about adding logistic network to the inserters. But everyone else can add more info too. Each section is repeated a bunch, but effectively Its a factory connected to a Storage and Requester chest. The Storage Chest holds the "output" and the requester chest "requests" the ingredients. The requester chest only hold 2x the ingredients needed to produce the item wants, and the Smart inserters connected to the output limit the production process by saying only produce up to X amount. the whole system self regulates as every item has a "buffer" number I can input into the system. What are "Provider chests used for? I dont see a use for them. Yes, the providers are always drained first. slpwnd wrote: Yes, the providers are always drained first. ...and if there is free space in the storage chest, the items from the provider chest will be transported there, even if not demanded from some requester chest. Pandamonium wrote: What are "Provider chests used for? I dont see a use for them. I think it's possible that storage chest will be filled with something and inserter could not unload items from assembling machine. But this situation is pretty fabulous. Undermind wrote: But this situation is pretty fabulous. yeah, same... I don't get it. He meant, your production line is clogged so badly you have your entire storage chest network full with unrelated products, blocking the unloading of a crafter. The best part of these self-limiting crafting systems is that you can easily modularize them and scale in a relatively low-tech level (the basic techs to unlock the filter inserter and red-greenwire networks are easily attainble with some hand-crafting of science packs), with the future blueprint mechanic I heard rumors of, expanding your base will be a breeze. That is a very nice layout, and has already given me new ideas to try. I came to the forums because I was having problems correctly setting the "red/green wire system". I am assuming only the items connected to 1 power supply will work. I have 20 items connected to a substation, which I believe is screwing things up for me. PS. I would of used "provider" chests instead of "storage" so that the drones will empty them first for the next step without double handling the material. Generally, you only need a Smart Inserter and a Smart Chest (or Logistic Chest) wired together at the end of a serial sequence like that. Rather than cut off the intake inserter, you shut off the output. The intake will continue for a bit longer while it builds up the stack limits inside the factory chain. It won't build up a full stack, but when the signal for the final Smart Inserter clicks for it to start pulling goods again, it immediately has a few to draw on and the factory doesn't have to wait for more resources. This is very useful for 'personal' goods that you eventually pick up to build with yourself. 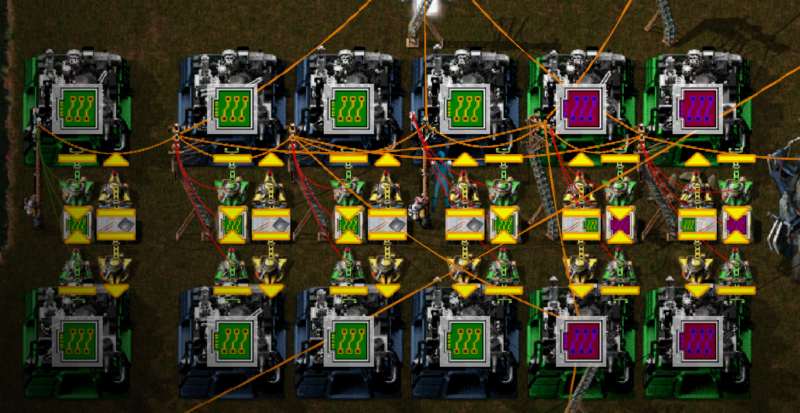 If you have a sizable circuit-A.Circuit-Mod-Mod2-Mod3 factory setup going, you just want to throttle the output on the Mod3 factory as it dumps into a chest as it gets to a fairly reasonable number for your future plans. I normally use Red wires for individual 'local' setups (aka RedNets) so that factories know when to stop producing too much of something because it's not not being used up enough/not being shipped out/too much cowbell. GreenNet, I mostly use in conjunction with train unloading stations so that the unloading arms know exactly how much stuff the base already has. This is especially important when I start using Logistic Bots that have absolutely no toilet manners when it comes to storage chests. The unloader stations need to know what's in storage, as well as what's sitting train-side, to decide if the base has enough/too much.